Do you Have The Right Type of Foundation? The best accessory for short hair isn't a killer pair of earrings or a decorative headband (although those are good too). Instead, it is flawless skin. If you're lacking in that department or you're not really sure if your makeup is right for you, it's time to reassess your foundation choices. The two must-have elements are the right color and the right type. If you find it hard to wade among liquid, powder and cream-to-powder foundations, here's the guide to choosing what works best with your skin type. Dry skin feels tight, looks flaky and can appear red/dehydrated. While you are more likely to experience this effect in the winter, some dry-skinned beauties experience this effect year-round. 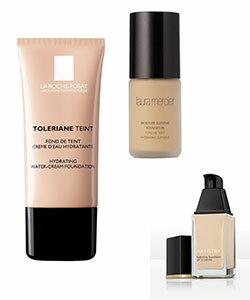 Foundation can be tough to apply to dry skin because it does not seem to cover evenly or appears blotchy. Although a moisturizer is in order to protect your dry skin, you also want a hydrating foundation. These may have a slightly thicker consistency than their oil-free counterparts. Liquid and stick foundations have a creamy consistency well-suited for dry skin. If you rub your fingertip over the stick foundation, it should feel weightless between your fingertips. Dry or sticky foundations that cannot be blended easily won't work for your dry skin. Don't give up on powder foundations either. Just look for one labeled “hydrating,” which means it contains skin-softening ingredients. One example is Trish McEvoy's “Even Skin” foundation, which contains skin-protecting ingredients such as silicone and glycerin for your skin to appear flawless, even with dry skin. When you have oily skin, the last thing you want to do is add more oil to the mix. Start by looking for an oil-free foundation of either the liquid or powder variety. Mineral makeup products also work well because they won't clog your pores and they go on smoothly. One to look for is bareMinerals’ original foundation, which comes in a variety of shades and has ingredients that offer SPF 15 protection. If you do opt for a liquid foundation, you may want to “set” it with a light dusting of translucent powder. This will make your foundation last longer. You also can look for a foundation that contains zit-fighting ingredients such as salicylic acid if you are so inclined. The catch is that you shouldn't rely on your foundation as your sole zit-fighter. The ingredients contained within usually are not at a high-enough percentage to zap zits for good. Combination skin can seem expensive: You feel like you need a foundation that addresses the oily parts of your skin and another to cover the drier portions. You have this skin type if you have a shiny forehead and nose, yet have dry skin on your cheeks and/or chin. Strike a happy medium by using a powder foundation. This type will soak up oil in needed areas while covering dry areas too. Cream-to-powder foundations go on as a liquid and dry with a matte, flawless finish and are well-suited for combination skin too. 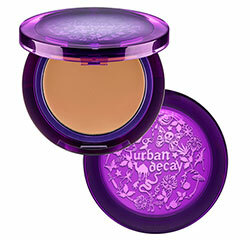 Examples include Urban Decay's “Surreal Skin Cream-to-Powder Foundation” that dries to a satin finish. Certain foundation types also contain ingredients designed for combination skin, including Clinique's “Superbalanced Makeup.” This makeup has proteins that keep oil at bay while also containing chamomile, an ingredient that can fight dryness-related redness. Whether your skin seems to break out at the slightest fragrance or you have rosacea, a skin condition that causes facial redness, sensitive skin needs a little TLC when it comes to your foundation choice. Always look for a foundation labeled “fragrance-free,” which makes it less likely to irritate your sensitive skin. One example Is Maybelline's “Superstay Silk Foundation,” which contains no fragrances and has silicone to help it last longer.